Each year during the Novena to Our Lady of the Sacred Heart, we pray in intercession to Our Lady. We petition for our own intentions and for the needs of our loved ones, and we unite in prayer with all who participate in our daily Novena Masses. Throughout the Novena, we remember specially all those enrolled in the Our Lady of the Sacred Heart Blue Book. A copy of the Blue Book is displayed on the altar at our daily Novena Masses, along with the prayers and petitions received from our mission friends. In 1857, Fr Jules Chevalier, founder of the Missionaries of the Sacred Heart, honoured Mary with the title “Our Lady of the Sacred Heart”. The Sacred Heart of Jesus is at the centre of everything that we stand for and do as Missionaries of the Sacred Heart. Mary, as His mother, offers her son to the world, so that we may join in union with Him and enter into His grace and mercy. It is Our Lady who unites us all as sons and daughters of God, and as brothers and sisters of Jesus Christ. During the Novena to Our Lady of the Sacred Heart, we come to Mary with our prayers and with our petitions, united in the faith of the Sacred Heart. All are welcome to join us in a blessed and prayerful Novena, and to submit personal prayers and intentions for remembrance. We would greatly appreciate your support for our ongoing mission projects, and in gratitude for your contribution, we will be glad to remember your intentions at our daily Novena Masses. You can then submit your personal prayers and intentions online, and our MSC priests will remember your petitions specially during our Novena to Our Lady the Sacred Heart. Mission friends from all over the world can share in the Novena to Our Lady of the Sacred Heart by watching our daily Masses live here on our website. 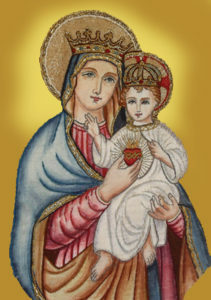 The Novena to Our Lady of the Sacred Heart takes place every year from August 31st through to September 8th, at the Sacred Heart Church on the Western Road, Cork. He gives you a share in His glory. He listens to your prayer. Offer Him our prayers of praise and thanksgiving. Present our petitions to Him. Share your petitions silently with Our Lady. Let us live like you in the love of your Son that His Kingdom may come. spreading over the world hope and salvation, justice, and peace. See our trust in you; answer our prayer. Show yourself always, our Mother.